Having told the world via the Internet, Tottenham have had to confirm to the Stock Market that they have agreed the purchase of Red Star Belgrade midfielder Milenko Acimovic. Having scored one of the goals that took Slovenia past Romania in the play-offs, he said he is looking forward to playing in the Premiership and at White Hart Lane. Although his work permit still has to be sorted out, the 25 year old told the official website that he knows that Tottenham are a big club and a special one too. He added that he has spoken to Glenn Hoddle a lot before the move and has the same beliefs as the Spurs manager on how the game should be played. It is believed that Acimovic is available on a free transfer and he leaves Red Star under a bit of a cloud after being sent off in his last match for the Yugoslavian club on Saturday. Glenn Hoddle is still not sure what his squad are capable of, as he has never had the Tottenham team he wants to play available all season. With Stephen Carr out for the whole season and Goran Bunjevcevic and Gary Doherty out long term, the others in the squad have often been out for shorter periods, leaving Hoddle to cobble together a side from those remaining fit. He also said that the Spurs team will have to become more clinical, as too many points had been lost by letting teams back into the game when Spurs should have killed it off. Spurs have announced that they will be playing a friendly at Cambridge United on Saturday August 3rd, a date previously thought to be that for the pre-season match against Watford. They are also looking to play QPR and an un-named team for Darren Anderton's Testimonial in the run-up to the new season. Former Romanian Spurs forward Ilie Dumitrescu has resigned as manager of Cyprus club Alki FC of Larnaca, amidst rumours bigger Cypriot clubs are seeking his services. Planet Football are claiming that Milenko Acimovic has signed a four year deal with Tottenham. While the club are yet to confirm the transfer from Red Star Belgrade, the player has revealed all and it is expected that he will be unveiled next week. Both Stephen Clemence and Simon Davies are expected to have talks with the club over new contracts in the next few weeks. Spurs reserves drew 0-0 with Ipswich Town reserves tonight at Stevenage Borough FC in a match that saw Jamie Redknapp play his first match since returning to Tottenham from Liverpool. Click here for match report. Reserve players Matthew Etherington and Johnnie Jackson have been selected for the England Under-20 team to play in the annual Toulon tournament. It is rumoured that Tranmere Rovers' 19 year old wonder kid - midfielder Sean Thornton - is set to agree a move to Sunderland. Spurs had been strongly linked with the Irish lad, but it appears that the thought of First Division football has won him over. Former Spurs winger Peter Taylor today quit as Brighton and Hove Albion's manager. Former Spurs defender Roger Nilsen has left Molde for Bryne on loan. Tim Sherwood will not be fit to play in the final League game of the season at Leicester City on Saturday May 11th. Leicester's Robbie Savage will miss the game too as he will be suspended. Glenn Hoddle told the official website that he believes that Spurs are two or three years off being able to match the top five teams in the Premiership. He said, after the win over Liverpool, that the gap was narrowing with the team having beaten Leeds a few weeks ago, but that on the day the Merseysiders had met their match. Hoddle has also been talking about his view of football in the future. He said that the collapse of ITV Digital here and the TV deal in Germany means that many clubs will be much more financially cautious. He said that he foresaw loans between Premiership teams, a second division to the Premiership, a transfer window and transfer fees and wages falling as clubs pay only what they can afford for the services of the players. With all this happening, he believes that Tottenham are likely to be in a better position when it all comes about as they have been well managed on the business side. Supposed Spurs target Milenko Acimovic was sent off yesterday in a Yugoslavian league match against Hajduk Kula. Former Spurs forward, Nick Barmby, has been linked with a return to the club. There has been little opportunity for him to break into the Liverpool side recently, so he will probably be part of the Houllier clear-out in the summer. Sunderland and West Ham United are also in for the little ex-England man and a price of £5 million has been floated for his services. Tim Sherwood has been linked with a move to newly promoted West Bromwich Albion. Manchester City have apparently made a move for Tottenham's chief scout - Graham Carr - according to TeamTalk. Some reports say that he has left already and Spurs will appoint a replacement in the summer. Newcastle United are the latest club to reject the chance of taking Bayern Munich's Stefan Effenberg on their books. Spurs have been strongly linked with the controversial German for some months now, but no move has apparently been made for him. Spurs beat Liverpool 1-0 this afternoon in a Noon kick-off. Gus Poyet scored the goal that gave Spurs a valuable win. For a match report, click here. For reaction, click here. Glenn Hoddle has been linked with a raid of his old SCBC to bring Marian Parhars to Tottenham. A Sun newspaper story reckons that he will offer Sergei Rebrov in exchange for the "Latvian Michael Owen". SPURS TEAM NEWS : - Tim Sherwood will face a late test on his gashed leg before tomorrow's game, as does Ledley King on his Achilles injury. Steffen Iversen will be fit after he did not break his jaw at Bolton last week. Ziege and Richards are definitely out. LIVERPOOL TEAM NEWS : - Emile Heskey hopes to play alongside Michael Owen, which mean that Nicolas Anelka could return to the substitute's bench. Abel Xavier could be back at right back. Glenn Hoddle told the Sky Sports site that he will send Spurs out to win tomorrow against Liverpool, knowing that should the away side win, they would close the gap on other title chasers. The Spurs boss said that he wanted the six points available in the last two games to try and finish seventh in the Premiership. Tottenham are being linked with a move for 25 year old Red Star Belgrade attacking midfielder Milenko Acimov within the next week. The Slovenian international claims that he has been talking to Spurs for about three months and that he has to play next week to prove his fitness ahead of the club medical prior to signing a contract. Panathinaikos and Hamburg are also waiting with offers in case the deal falls through. Hoddle has said on the Sky Sports site that he has monitored the player, who is one of six or seven on his wish list. It also said that Hoddle said a deal would not be sealed this weekend and Acimov has told a Slovenian newspaper that the deal is not certain. Real Mallorca are reportedly ready to release Samuel Eto'o to a top European side in the summer. Arsenal, Liverpool, Glasgow Rangers and Spurs are all clubs who have been linked with the Cameroon international recently. His agent said six other Premier league clubs were going to Spain to watch him, but admitted that Tottenham were top of the clubs chasing the young former Real Madrid forward. Tottenham are supposedly interested in USA offensive player Clint Mathis. The New York MetroStars striker is also being watched by Manchester City and has expressed a desire to come to England. When Tottenham rip up the White Hart Lane pitch after tomorrow's game, they are preparing one foot square turfs from it for sale. Each square will be available for £10 minimum donation, as all money made from the sale will go towards the Football in the Community scheme. Some more important parts of the pitch, such as the penalty and centre spots at £50 min. and the corners at £30 minimum each. The turf will be on sale on Monday 29th April at the ground between Noon and 8 p.m.
... and finally 1 ... Daily Soccer carries a story that starts ... "Foreigners will be invited to try specially prepared dog meat juice outside the World Cup stadium in a bid to fight "prejudice" against the South Korean delicacy, restaurateurs said Friday. "We plan to develop canned dog meat tonic juice, which football fans can enjoy in their stadium seats while watching games," said Choi Han-Gwon, a leader of a national association of dog meat restaurants. "They will enjoy it instead of Coke," he said." A national association of dog meat restaurants ... isn't that bringing game into disrepute ?? ... and finally 2 ... "Arsenal defender Martin Keown believes Ashley Cole's controversial goal-line clearance against West Ham suggests that fortune is starting to favour the Premiership leaders. "In the past we have not been so lucky."" He's a cheeky monkey isn't he !! Sergei Rebrov will be joining Bayer Leverkusen if the story put around by the Ukrainian national coach. Leonid Buriak said that the Spurs striker would be signed by the Champions League semi-finalists who are believed to be ready to offer £5 million. Lazio were interested in Sergei, but wanted to offer Jaap Stam in a part-exchange. However, the Dutchman did not want to join Spurs. Rebrov's agent has dismissed this story as rumour because Spurs have not put him on the transfer list. Christian Gross, the former manager of Spurs, has won the Swiss League title with FC Basel. Tottenham Hotspurs Supporters Trust member Peter Haring has revealed the extent of his discussions with Daniel Levy on season ticket prices. Haring told the London Evening Standard that he had told "Levy all the fans would probably feel that the priority is to catch up with the leading clubs. The supporters will tolerate such large ticket price increases only if the club shows that it is determined to achieve this. "In putting up prices they are asking us to make an act of faith but this is the last time they'll be able to ask it unless their actions justify it. I've told them many times, as forcefully as I can, that Spurs supporters have been incredibly patient despite immense frustrations and disappointments but now we need to see the benefits of our patience and loyalty." This comes on the day it was revealed that both West Ham United and Chelsea were freezing their season ticket prices. Levy said that the Tottenham wage bill was very large and that some transfer targets were asking for absurd amounts as a salary to join. Kasey Keller will be travelling to North Carolina to join up with the USA World Cup squad when the Spurs players will be having a fortnight's rest !! With no game because of the FA Cup Final, the rest of the team will be without a game, but KK will fly out to join up with the rest of his American colleagues for a training camp, he told the official website. Anthony Gardner has told the Spurs website that he is still learning every time he plays for the first team. Despite playing against the top strikers in the Premiership, he said he analyses every match and tries to make improvements to his game. The tall defender said he was pleased to get back playing after his knee ligament injury in the last game of last season, but is keen to break into the England Under-21 squad for the European championships this summer. Spurs are believed to be waiting in the wings, with Everton and Sunderland to sign Doncaster Rovers wide-man Andy Watson. The 23 year old winger has impressed watchers and has been the subject of a failed bid by Stockport County, although the club have confirmed that he will be sold if the right price is met. Sam Allardyce has responded to stories linking Michael Ricketts with a move out of Bolton Wanderers by saying the forward is going nowhere. Daniel Levy has told the London Evening Standard that the club must be based on sound financial foundations for the future. The Spurs chairman said that the price rises for season tickets (some the most expensive of which have gone up by 33%) still are regarded as good value compared to match-day prices !! A report on Daily Soccer reveals that a third of Spurs fans earn £50,000 a year and that Tottenham fans are the nation's most middle-class supporters, with 61 per cent of season ticket holders classified as being in social group AB. Oh, I say !! Steffen Iversen has agreed with manager Glenn Hoddle that he could notch 20 goals a season if he stayed fit. Speaking on the club's website, the Norwegian said that the side are creating a lot of chances and he thinks that he could cash in on them to bump him up the goal-scorers chart. He added, ruefully, that the fact that the season always ends too soon for him ... just as he returns from injury. SCBC stalwart, Matthew Le Tissier, has revealed that he turned down a move to Tottenham once. He said that as a Spurs fan, it was a difficult move to turn down, but SCBC offered him the same money as Terry Venables in 1990, so he stayed put in the lower reaches of the League - something he has no regrets about. Jamie Redknapp was due to make his Spurs debut in the reserves friendly at Spurs Lodge today against Nottingham Forest. Lars Hirschfeld is the subject of Glenn Hoddle's decision on his future. The Canadian keeper has done well in his time on loan at the club and should Hoddle retain him on a permanent contract, it might spell the end for Kasey Keller at the club. Reports indicate that Michael Ricketts is unhappy at Bolton Wanderers after having been unable to get a regular starting position in the struggling team. Since, Sam Allardyce brought in Youri Djorkaeff and Freddi Bobic, Ricketts has slipped out of contention and might seek a move to help him regain the form that got him his England debut earlier this year. Spurs and West Ham United could be willing to pay the rumoured £10 million needed to part him from his current club. Former Spurs winger Ruel Fox has been released by West Bromwich Albion. Former Spurs defender Ramon Vega says he is sorry that he ever joined Watford. He thinks the Hornets have never got going this season and the fact that he was transfer listed and dropped about five weeks ago means he has not even been playing. He said on his website that he has an open mind about where he might go, but the ITV Digital situation is making it difficult for clubs to spend money like they have done in the past. Does he mean that he will not be worth much in the current transfer climate ?? ... and finally 1 ... Leicester City midfield player Robbie Savage has been reported to the FA for using the referee's lavatory before the game against Aston Villa on Saturday. He refused to close the cubicle door and then refused to flush. As Rowan Atkinson once said "I wouldn't trust him to sit the right way round on a lavatory !!" Mind you, I wouldn't want to use a bog after him ... you don't know what you might catch !! ... and finally 2 ... Jimmy Floyd Hasselbaink on Eidur Gudjohnsen (not literally, but after this you wouldn't be surprised) ... "We love each other and have a great relationship." Les Ferdinand has urged Sergei Rebrov to stay at White Hart Lane next season. He said that although the Ukrainian had not clicked on the field, he was popular off it and the other players were desperate for him to work out his differences, rather than leave to get first team football elsewhere. Both Ledley King and Dean Richards are battling to return from injury. Ledley said he hoped to be back for Saturday's match with Liverpool and Deano wants to play again before the end of the season. Kasey Keller has been named in the USA World Cup squad announced today. Jamie Redknapp said that his career had come full circle now that he had returned to the club that he played for a as schoolboy. The former Liverpool midfielder added that he would be disappointed if the mix of young and old players in the side did not make Europe at the end of the coming season. He said on the Spurs website after his first day of training at his new club that the club is massive and he is glad to get the chance to know the players now before he is allowed to play in the first team next season. John Gorman said that the match at the Reebok stadium summed up the team's season. On the official website, he bemoaned the fact that the lack of a clinical edge to the side had cost them four points including the West Ham United match. Stefan Effenberg is likely to be joining Manchester City according to the Sun newspaper. The German was a target for Spurs earlier this season and at the end of last season. Sheffield Wednesday's £1.5 million rated central defender Leigh Bromby is being linked with Tottenham again today, as well as Chelsea. Former Spur Mitchell Thomas is to be released by Burnley at the end of the season. Spurs are reported as being ready to make a £7 million bid for Real Mallorca's Cameroon striker Samuel Eto'o, according to the Mirror newspaper. The Spanish club, however, are said to want £10 million for him. Following the Liverpool match on April 27th, the Spurs pitch will be ripped up and replaced with a revolutionary new technique that has been used effectively at Anfield. Employing new drainage sub-soils and plastic strands, the grass twines itself around them to gain strength and apparently makes it difficult to take a divot out of. The Groundsman told the Spurs website that it will provide a level playing surface for Tottenham to play their passing game on, but will not change the amount of sunlight that gets to the Southern end of the pitch. This means it might be that the area gets less grassy as the season goes on, but they still might use mirrors to increase the natural lighting to that end of the pitch. None of the famous Sir Alan Sugar smoke was mentioned though !! Ben Bowditch played at right back for England Under-18s in their 2-1 away win over Lithuania to take them to the European Championship finals in the summer. Reserve and Under-19 defender Jamie Quilter will play for Oxford Reserves tonight as he tries to establish a contract away from Tottenham. Steffen Iversen has had checks on his facial injury and they have shown no lasting damage. It was feared that he had a broken jaw, but X-rays showed this is not the case in his face. Aberdeen's young defender Kevin McNaught has been linked with a move to Tottenham. The highly rated 19 year old can play any defensive position and is nicknamed "Sammer" after the German sweeper of the same name. Josep Guardiola has again been linked with Tottenham although the player is being linked with numerous clubs across Europe now that he will leave Brescia in the summer. Ben Bowditch has been called up into the England Under-18 squad for the second leg of the European Championship play-off qualifer in Lithuania. West Bromwich Albion will be playing in the Premiership next season after winning the second automatic promotion place on the last day of the Nationwide Division One season. Spurs Ladies beat Viking Ladies in a friendly this afternoon by 3 goals to nil. The scorers for Tottenham were Chrissie Oshodi, an own goal and Gill Blackmore. The Tottenham Veterans XI took on Wealdstone Old Boys XI this afternoon and gained a 3-3 draw thanks to a late goal. Featuring John Pratt, Mark Falco, Martin Chivers, Ralph Coates, Tony Galvin, Garry Brooke and Richard Cooke, the team were 0-2 down for the bulk of the game, but a thrilling finish saw them draw level. Their goals were scored by Earl , Steve Smart and an unnamed player (who didn't look like an ex-Spur). Former Spurs and now Leicester City keeper Ian Walker is interesting Everton for £2 million. ... and finally ... Tony Adams has blamed George Graham for his alcoholism. He said he was so afraid of his manager that he drunk to stop him hitting Graham. Tottenham drew 1-1 with Bolton Wanderers at the Reebok stadium this afternoon. Steffen Iversen scored for Spurs. For reaction click here. Steffen Iversen will have X-rays to determine the extent of the injury to his face sustained in a collision in today's match. He may have fractured his jaw and could miss out on the final games of the season if this is the case. Spurs season tickets have risen by up to £100 as the 2002/2003 prices were revealed on the club website today. The North Stand tickets will go up to meet the price of those in the South Stand after they had been subsidised for some time. Daniel Levy said on the Spurs site that there will be a limit of 23,000 season tickets this season and prices for the coming season will range from £495 to £1,200 in the West Stand Upper. See the Supporter's Trusts view by clicking here. Click here for the new prices in detail. SPURS TEAM NEWS : - Mauricio Taricco could come in for injured Christian Ziege, following his suspension. Defenders Ledley King and Dean Richards both are out with injuries. BOLTON TEAM NEWS : - Paul Warhurst (heel), Ricardo Gardiner (hamstring) and Stig Tofting (bruised foot) are al very doubtful for the home side. Gudni Bergsson might replace suspended Kostas Konstantinidis. Former Spurs skipper Gary Mabbutt told TeamTalk today that he believes that Gary Doherty's versatility will gain him a place in the Republic of Ireland's squad for the World Cup. This hasn't stopped the transfer mill from turning incessantly ... the young Nottingham Forest midfielder Gareth Williams is the latest linked to the club. Spurs will vie with Celtic and Glasgow Rangers for the talented 20 year old, who is rated at £2 million. Sunderland have expressed an interest in taking former Barcelona captain Josep Guardiola to the Stadium of Light. Spurs were linked with the player at this time last year, but having signed Jamie Redknapp might now look to strengthen the side in other positions. A player who was linked to a move to Tottenham, Polish international Bartosz Karwan, has signed for Hertha Berlin. The 26 year old who can play right side in midfield or up front has agreed terms with the German club rather than join Schalke 04, Southampton or Tottenham. The Spurs Veterans XI will be taking on the Wealdstone Old Boys at the Wealdstone FC Funday on Sunday at the White Lion Ground, High Street, Edgware, Middlesex. The team will be chosen from Dennis Bond, Garry Brooke, Mark Falco, Richard Cooke, Les Boughey, John Pratt, Paul Allen, Jimmy Neighbour, Paul Price, Phil Beal, Tony Galvin, Gerry Armstrong, Milija Aleksic, Ian Culverhouse, David Kerslake, Steve Grenfell, Shaun Close, Ralph Coates, Martin Chivers, Tommy Harmer, Cliff Jones and Johnny Ryden. There will be a match featuring the Tottenham Ladies v Vikings Ladies and an under-11s five a side match too. It all starts at 13.00 and entry is Adults £6, concessions (OAPs and U-16s) £3, with a family ticket of two adults and two children for £10. 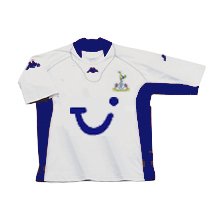 After the original drawing of the Kappa designed Spurs shirt being withdrawn from the official site, there are new pictures now of the home and away kits. Go to http://www.spurs.co.uk/article.asp?article=90101 to view them. MEHSTG has been assured that Daniel Levy strongly lobbied Thomson about the colour of the logo, but Thomson's recent take-over and redesign of the company sign meant that they were adamant that they wanted to stick with it being red. The comments at the Press conference at the launch were not flippant, but in response to direct questions about the colour. The deal is significantly better than a lot of clubs can expect and with a number of Premiership teams vying for new shirt sponsors, it was important to gain the best deal for the club amongst all the other deals flying about. While the company are paying to advertise on the Spurs shirt, we suppose that the reason they chose Tottenham was to reach as big an audience as possible and the reaction by the fans to the colour of the logo has ensured that they have had good exposure in the media. If they had been determined to use the colour scheme throughout, they could have asked for a white oblong to be inserted on the front of the away shirt with the red logo repeated there. As it is the logo appears as white on the navy change kit. A report in the Daily Telegraph hints that there will be a pay-as-you-play clause in Jamie Redknapp's contract. His injuries have drastically reduced his appearances for Liverpool over the last two years and on top of a basic salary, he will receive additional payments for the games he does play. The report also says that he might be able to play against Leicester City as the game does not affect any vital placings in the Premier League, unlike the matches against Bolton and Liverpool. Jamie Redknapp has said that he wants to get back to enjoying his football and that if he is doing well for his club, then there may be the chance of an international recall in the future. he said he would like to think that he still has a few good years left in him. Steffen Freund has said that the signing of Jamie Redknapp proves that Spurs will be able to draw the big names to the club. He said that Redknapp is a strong player with few faults and will be important to the club. Gary Doherty scored his first goal for the Republic of Ireland against club colleague Kasey Keller to help them beat the USA 2-1. His 83rd minute header form a Staunton free-kick helped the Republic win on a soggy pitch at Lansdowne Road, Dublin. Doherty had come on in the 70th minute as a substitute. Teddy Sheringham was a second half 68th minute substitute for England in their 4-0 win over Paraguay. Both Steffen Iversen and Oyvind Leonhardsen started for Norway in their 0-0 draw with Sweden, but Leo left the action after 67 minutes. Sergei Rebrov played 64 minutes of Ukraine's friendly against Georgia today and scored the first goal for his country in a 2-1 win. Tottenham have signed Jamie Redknapp on a four year deal on a free transfer from Liverpool. The former Spurs junior was released by the Merseyside club today and he was snapped up as Tottenham have been linked with him all season. Having passed a medical before signing, he said he was pleased to do so and that he wanted to come and do a good job for Tottenham. Redknapp added that he was buzzing after the move and was thinking positively about the transfer, believing that everything is going in the right direction and that with a bit of luck the club could have won something this year. He added that if he didn't believe that the side had a chance of moving forward, he would not have joined. The 28 year old midfielder said it had all happened quite quickly over the last few days and that he looked forward to renewing his working relationship with Glenn Hoddle and John Gorman who he knows from his England days. He said he is disappointed that he cannot play in the remaining games of this season, but felt that moving now would help him settle in and get to know the place. For a long time, rumour had speculated that he wanted to return to London at his wife's behest, as she wanted to be nearer her family. Glenn Hoddle said he was really pleased that Redknapp had joined Tottenham and thinks he could be a real steal. Hoddle said that after a few months of next season the fans will be purring over the England midfielder and that having fought off some other clubs and a good deal from Liverpool, the player could have saved Spurs £6-7 million in the transfer market. The manager believes he will be a major factor in moving the club forward, he told the official website. Former Liverpool defender/midfielder Christian Ziege will be out for two weeks after having an operation to remove some bone form his ankle after receiving the injury on Saturday against West Ham United. However, a statement from the Germany camp says that his World Cup chances are not in any threat from this surgery. Glenn Hoddle has said today that Sergei Rebrov still has a future with Spurs. In an Evening Standard interview, the Tottenham boss stated that the player had not become a bad one overnight and hoped that he could translate his form in training into the Premier League. Hoddle believes that the can be a good player again, given a goal or two's confidence and he praised his attitude and said the two had talked often about the situation. Meanwhile, Spurs have been linked with Mansfield Town hot-shot forward Chris Greenacre. It looked as though Bradford City were set to sign him ,but David Pleat's been impressed enough to allegedly persuade Spurs to bid for the 30 goal man. Norwegian national coach Nils-Johan Semb has told Oyvind Leonhardsen to quit Spurs to further his international career. He said not playing first team football could hamper his chances of being chosen for his country. The player said he is under contract until the end of 2003, but wants to play in the first team, although he said that if he did move on he did not want to drop to the First Division. Spurs reserves lost 1-2 at home to high-riding Derby County at Stevenage tonight. Steven Ferguson scored the Spurs goal. A match report click here. Gavin Kelly, the reserve team keeper, has been training with Southend United and Cambridge United with a view to a long term deal after it seems he will not be retained when his current contract expires at the end of the season. Having been ousted by Canadian Lars Hirschfeld, he looks like moving out of White Hart Lane, after impressing on loan at Kingstonian last season. Ben Thatcher has told the official website that the side were gutted to concede the late goal that cost two points in the West Ham United match. He said that he would have preferred Tottenham to come form behind, but added that the communication between the back three is getting better with each game played and they are due for some competition when the other defenders regain their fitness. Gary Doherty has been called up to the Republic of Ireland squad to face USA on Wednesday after a number of players pulled out with injury. Recently returned from a broken ankle, he hopes to get a place in the World Cup squad for his country. Talking to the London Evening Standard, Doherty said he appreciated the warm welcome he got from the Spurs fans when he came on as a substitute against West Ham. Self-effacingly, he added that eh didn't know if he was that popular or whether the crowd felt sorry for him !! Conversely, Christian Ziege has withdrawn from the Germany squad to play Argentina on the same day after picking up an ankle injury against West Ham United on Saturday. Planet Football report that Graham Carr has been sent to Argentina to spot new talent for the club. Scout Carr has been reported as being at the San Lorenzo v Lanus match last Sunday. He is believed to have been running the rule over Rodrigo Mannara, a 22 year old midfielder who plays for Lanus. He also took in Argentinos Juniors v Belgrano and Estudiantes v Boca Juniors. Ariel Seltzer and Mariano Pavone are two names that have been linked to Spurs in the past and they are high on the list of top talent in the South American country. Estudiantes forward Pavone is an Under-20 international and another high scoring striker who might have caught the eye was Ernesto Farias. Bolton Wanderers manager Sam Allardyce has denied that Michael Ricketts could be allowed to leave the Reebok Stadium if the asking price of £10 million is met. Spurs have been linked with the big striker who has done very well this season in the Premiership. It is 13 years since 96 fans died in the tragedy at Hillsborough at an FA Cup semi-final between Liverpool and Nottingham Forest. Glenn Hoddle was again ruing the missed chances that could have given us the three points against West Ham United yesterday. He said that the team as a whole played well in the second half and it was disappointing to concede a late goal again. The Spurs boss said on the official website that the team will have to stop conceding cracking goals to opposition centre halves !! Daniel Levy has apparently given Glenn Hoddle the go-ahead to spend whatever it takes to get up there and challenge with Manchester United and the rest at the top of the Premier League. This had lead to a flurry of transfer speculation, including a prospective £7 million bid for Crystal Palace's Clinton Morrison. The First Division hot shot is apparently, one of many players on Hoddle's wish list. Perugia's Fabio Bazzani is another striker who is being strongly linked with the club. Bologna's Julio Cruz is being mentioned in connection with a summer move to Spurs again. Chris Armstrong could be a transfer target for Millwall o they get promoted. His old club would take him back if he can prove his fitness after long periods of injury over the last few years. Tottenham drew 1-1 with West Ham United this afternoon at White Hart Lane. Spurs' goal was cored by Teddy Sheringham. For a match report, click here. For reaction, click here. Les Ferdinand thinks that Ledley King should win the PFA Young Player of the Year award, because he has shown great versatility in his performances this season, he said on Icons.com. He said the young defender looks like he has been playing Premiership football for ages and even though he has made mistakes, has been clam enough to get on with the game. On a more personal note, he wrote on his Icons.com page that he hoped to break the 20 goal barrier this season, but will now settle for doing it next season. Hmm. With any more injuries like this Les, the amount of time spent out will probably preclude that happening. Teddy Sheringham has been included in the England squad for the match against Paraguay this Wednesday (17th April). Darren Anderton has been omitted form the national party for the match. Rumours at the Lane today are that Arsenal are interested in Chris Perry and that Zamora, Redknapp and Phillips are all done deals. Former Spurs Peter Taylor has guided Brighton and Hove Albion to the Second Division championship on his first season at the Withdean Stadium. SPURS TEAM NEWS : - Dean Richards will miss the game and Ledley King has bruised calf. Steffen Iversen and Anthony Gardner are both trying to shake off a bout of flu. Gary Doherty is included in the squad for the first time in seven months. WEST HAM TEAM NEWS : - Paolo Di Canio is ruled out and is replaced by Jermaine Defoe, while Winterburn is out with Labant coming in at left back. Dean Richards is likely to miss the rest of the season with a medial ligament knee injury. He does not have a cartilage problem or a cruciate ligament injury. Glenn Hoddle was not confident that the central defender would be fit within two or three weeks, so will miss being ready for the World Cup. It is believed that Uri Geller will be trying to heal Deano by placing the hands of the pubic on pictures of Richards' knee on the front page of tomorrow's newspapers. Perhaps that is the reason why they are watching Wolverhampton Wanderers' 19 year old defender Joleon Lescott, who is also interesting Arsenal and is rated at £4 million. Personally, I prefer the ones above, just for their designs. The London Evening Standard are reporting that Glenn Hoddle is recommending Darren Anderton take David Beckham's place should he not make the England squad for the World Cup. Anderton claimed to be fully fit again after a hamstring tear. Just with a World Cup coming up ?? With his reputation ?? Surely not ?? Neil Sullivan's injury has forced him to withdraw from the Scotland squad to play Nigeria next week. But his goalkeeping pal Krazy Kasey Keller has been named in the USA squad for next week's match against Republic of Ireland at Lansdowne Road, Dublin. Christian Ziege will be in the squad for Germany's friendly against Argentina next week too. Spurs have announced the new club shirt sponsor as Thomson's Holidays. The two year deal is worth a substantial amount (guessed to be £5 million by some papers) and there will be spin off benefits for Tottenham supporters being offered special deals with the company. The deal starts on July 1st. It appears that the red in the Thompson "smile" logo has been nothing but a source of hilarity for the members of the board and players. Chairman Daniel Levy said that there is red in the club badge so it was not a problem and Les Ferdinand reiterated this (bringing in the fact that Arsenal and Manchester United had worn blue shirts of late), while Director of Football David Pleat said the last five winners of the Premier League had worn red, so it hadn't affected their performance. Following the announcement today, there has been a website set up to take names for a petition to get the colour of the logo changed. Spurs are believed to be offering £5 million for Aston Villa's Lee Hendrie. The 24 year old midfielder has annoyed current Villa boss Graham Taylor by asking to be rested recently. He would be just like the rest at Spurs who need a rest around this time of the year and probably wouldn't need to ask !! The official website have released the results of the Spurs player they will name a lounge after at White Hart Lane and Steve Perryman won with 52% of the votes, beating Jurgen Klinsmann (29%). Christian Ziege has been telling the Spurs website that he is reeling form the number of local derbies we have had this season. Up until now, he has only been used to one with Liverpool and two while playing for Middlesbrough. Saturday will be his and Spurs' fourteenth of the season and while he thinks that only the Arsenal and Chelsea games have been special and "a battle" respectively, he has found the number "different" to the other game sin the Premier League. Meanwhile Ziege has been called up for the Germany squad to play in a friendly against Argentina in Stuttgart on April 17th. Tottenham are being linked with £8 million rated Glasgow Rangers striker tore Andre Flo. The Norway and former Chelsea forward is likely to be part of the clear out at Ibrox as new manager Alex McLeish raises funds for rebuilding. The club have even been associated with an interest in Leeds United wing back Ian Harte. However, it is thought to be wild speculation as Spurs are well served on the left side of the team at the moment. Glenn Roeder has told how grateful he is to Glenn Hoddle for taking into his England back-room team while he was national manager. Roeder takes his West Ham team to face his former boss on Saturday and he has said the work he did with England has helped him in his current role. Johnnie Jackson played for England Under-20s last night in the 0-2 defeat by Portugal. Spurs have revealed that they have received £500,000 for the two moves Peter Crouch has made since leaving Queens Park Rangers. The transfers to Portsmouth and Aston Villa have included cuts for Tottenham from a sell-on clause. Ledley King has been advised by the club to have a scan on his troublesome Achilles tendon injury to determine the extent of the damage. The defender is having intensive treatment for the game against West Ham United on Saturday and will have a late test to see if he will be fit. Steffen Iversen and Oyvind Leonhardsen have both been name din the Norway squad to face Sweden in a friendly on April 17th as part of the Norway FA's centenary festivities. Spurs have fixed up a friendly at Gillingham on Saturday 27th July and there are rumours that Spurs will play at Watford in pre-season during August in a testimonial for Nigel Gibbs (thanks to Stuart Winyard for the info.). Tottenham reserves lost 1-3 to Fulham reserves at Woking tonight. The Spurs goal came from the boot of Stephen Clemence. Summing up (although not very mathematically) on the official website, Colin Calderwood said of the Under-19 players in the side ... "I said to them that 99.9 per cent of their game was excellent, but that .1 per cent is a goal. So that takes away 25 per cent of your performance and we've got to get that out of them. You go 90 minutes and your man doesn't score - that's the little tasks we set in front of them." Stephen Carr has said that he will not get depressed about his injury ruling him out of the World Cup as there is always someone worse off than himself. In an interview with the Spurs official website, he said that players such as Chris Armstrong have suffered more and Willem Korsten has had to give up the game. Carr added that he is sure he will get fit and be playing again ... although he didn't say who for. Brighton and Hove Albion have said that they will knock back any efforts from Premiership clubs to take Bobby Zamora away from the club just promoted to the First Division. This includes Tottenham who have been constantly linked with the striker who has 32 goals this season. Rumoured Spurs transfer Target Steffan Effenberg of Bayern Munich is supposedly having talks with Manchester City, as is Edgar Davids. It would seem these stories are about eight days too late !! Stjepen Tomas, a Croatian full back has been linked with a mover to Fulham or Tottenham. The 25 year old international plays for ENIC club Vicenza and is available as they seem unlikely to gain promotion from Serie B. The Italian club said they are not in a position where they need to sell players, but would accept an offer if a suitable one came along. Spurs have lined up another pre-season friendly against Southend United. Tottenham will travel to Roots Hall on Tuesday July 30th with the game kicking off at 7.45pm. This game takes place just 24 hours before a strong Tottenham side goes to play Crystal Palace at Selhurst Park for Simon Rodgers' testimonial. Neil Sullivan is in the Scotland squad to face Nigeria at Pittodrie on 17th April. Glenn Hoddle reveled today that he is in discussion with the board at the club about increasing the size of the first team squad after losing Dean Richards and Ledley King (Achilles) to injuries in Saturday's match against Arsenal. Steffen Iversen also has a big haematoma on his thigh" according to the manager on the official website. He said that the team are down to the bare bones and stressed the need to strengthen the squad in the summer. Sergei Rebrov wants talks with Hoddle come the end of the season to determine his future. The Ukrainian striker said he is not sure who will buy him at the probable asking price Spurs will demand, but he would like to return to Dynamo Kiev, although he realises they would not be able to afford him. He said other clubs have expressed an interest, but he wants to know what is going to happen as he is contracted to Tottenham for another three years. Teddy Sheringham has told the Spurs website that the team's season is still alive, fending off a number of clubs who share the accolade of the 7th best team in the Premier League. Bayern Munich captain Steffan Effenberg has so far been unsuccessful in his attempts to come to London to pursue his dream of Premier League football. His talks with Fulham have ended in failure and it remains to see if Tottenham will follow up their interest in the former German international. Spurs have taken Faroe Islands international Jon Roi Jacobsen on trial for a second time in a matter of months. The 19 year old from the HB 1904 club of Torshavn has impressed the Spurs management on his first crack in the Under-19s and the striker is back for another period where he will look to make inroads towards a permanent deal. Thanks to Hans Meekers, our Belgian correspondent, who reports that Mohamed El Yamani, may not be the bargain he seems. He was a star of the Under-21 World Cup last year, but did not move when the big guns were circling Standard Liege. However, a trip to Egypt to rest saw him write off his car in an accident and nearly write off his career, spending a week in a coma. He is now coming back, but it is not sure if the 20 year old will be the player he was previously, as he hasn't made it back into the Standard Liege first team yet. In Hans' opinion, any bid near £2 million would be grabbed at the quickest opportunity. Not only that, but they have a red logo !! At least we will be able to get into Europe !! Norway manager Nils Johan Semb has told Steffen Iversen to calm down and not dive into tackles that he doesn't have to. Well, that's fine mate when he's playing for his country, but we pay him to get stuck in at Tottenham. Iversen picked up a dead leg in a clash with David Seaman and said it went stiff straight away. The national coach added that the striker should have been taken off immediately to give his injury a chance to heal quicker, rather than be left on the pitch when he could not run. Glenn Hoddle said he was disappointed that Spurs did not weather the storm after equalising in the derby match yesterday. Talking to the official website, he explained that he thought the team were not bringing the bal out of defence well enough in the first half, so made a change to get back into the match. Latest transfer rumours link Spurs with summer moves for Martin Djetou, the former Monaco defender now with Parma in Italy. He can also play in midfield and would be available for around £4 million as Parma seek to offload him, although Liverpool are also rumoured to be interested. With Liverpool chasing the young defender, Spurs are said to be looking to return Nick Barmby to White Hart Lane. The former Spurs forward is said to be seeking first team football after being frozen out of the picture at Anfield and could be for sale at £6 million. Yet another Liverpool link comes in the short shape of Danny Murphy. The England midfielder fears that he will not be offered an extension to his contract that expires in summer 2003, so might be shown the door. Chelsea and Spurs are supposedly keen on the £8 million rated 25 year old. Another name linked with the club is Standard Liege's Egyptian striker Mohamed El Yamani, who has been said to be one of the hottest properties in Europe. Juventus and Bayern Munich have been chasing him and a reported £8.5 million bid has already been turned down by the Belgian club for him. Where that money would come from is another question ... although we do have some cash from the shirt and kit deals. Another report says his agent reckons he could only cost £2 million soon. Now that's more like it !! Spurs lost 1-2 to Arsenal at Highbury today. Two penalties in the last 10 minutes settled the match, with Sheringham scoring for Tottenham from the spot, before an 86th minute spot kick won it for the other side. For a match report, click here. For reaction, click here. Spurs Under-17s progressed to the next stage of the Premier League competition by beating Coventry City 2-1 to top their play-off group. For a report, click here. Tottenham are said to be watching Bologna's 27 year old Argentine striker Julio Cruz. Representatives from the club are due to watch him play for his club against Torino this evening and with Sergei Rebrov believed to be on his way out of White Hart Lane, a replacement will be needed. Atletico Madrid and Real Betis from Spain are also believed to be in the hunt for the signature of the man who has scored 10 times in 28 games in Serie A this season. Johnnie Jackson has said that he is glad to be back playing after suffering tendonitis in both knees this season. The England Under-19 is starring in the midfield in the reserves and hopes to get a couple more games under his belt before the season ends, he told the club's official website. Having slimmed down since he was out injured, he has enjoyed his role in the reserve side and would like to think that his good performances will get him recognition in the first team squad, which he was included in for the trip to Middlesbrough and the home game against Leeds United. ... and finally ... don't cry for me Leicester City ... the Foxes were relegated from the Premiership this afternoon with a 0-1 defeat by Manchester United. Shame. Tottenham have announced a £15 million deal with Kappa to be the new kit suppliers to the club for four years. The new kit, which will be like the Italian kit worn in last week's international and therefore should be quite plain, will be unveiled next week, when a new shirt sponsorship deal is announced. It will embrace the new Kombat 2000 technology to produce figure hugging shirts that make it more difficult for opponents to tug. They will look really great on the fans !! Valencia have been watching Sergei Rebrov in recent games according to Soccernet and they are poised to make a summer move for the Spurs striker. It is thought that they would be willing to go up to £8.5 million for the Ukrainian forward and Tottenham might be tempted to take the money and the saving in wages. With his on pitch time severely limited, Hoddle would no doubt jump at the chance to bring in his own man, as he clearly does not want to play Rebrov unless he has to. SPURS TEAM NEWS : - Ben Thatcher is a doubt after suffering a high temperature for two days, while Ledley King, Neil Sullivan and Christian Ziege will all face late fitness tests. ARSENAL TEAM NEWS : - Full back Ashley Cole will miss the match although his knee injury is not that bad. Tony Adams, Ray Parlour and Lauren are all said to be available for selection. Denis Bergkamp and Freddie Ljungberg are urging their side to take this like a normal game and not concentrate on the fact that it is a North London derby. I am sure that the Tottenham team will be approaching the match in the same manner !! Gus Poyet fancies scoring a goal in tomorrow's North London derby, as he has scored three goals at Highbury for Chelsea when he played for them. He said that he felt that Spurs were the better team in the previous meeting this season and that his late equaliser was justice for the team's display. Kasey Keller is hoping to retain his place between the sticks as he wants to taste the atmosphere of the North London derby. The American keeper said he needs to be in the side to maintain his place in the national side and to give Glenn Hoddle the least excuse to leave him out. Hoddle believes that Spurs will go into tomorrow's game with a belief borne out of a three game unbeaten run and the fact that anything can happen in a derby match. Teddy Sheringham has told Glenn Hoddle that he will not be happy if he is substituted against Arsenal tomorrow, like he was in the final minutes of the Leeds United match on Monday. The Spurs captain said he wanted to play every minute of each match and although he admitted he was not "firing on all cylinders", he said all players go through a dip in form. Yes, Teddy and such players find themselves being substituted ... whoever they are if they are not doing the business. Ledley King said he hoped to shake off a little knock he picked up against Middlesbrough to play in the game against Arsenal. He said that these are matches that players want to be involved in and he felt that Spurs could do well after their showing against their local rivals in the match at White Hart Lane earlier this season. The England defender acknowledged that the opponents were very quick on the break and that the Spurs defence would have to be on their toes to keep them at bay. Defender Christian Ziege thinks Spurs could decide where the title might end up. He is still trying to overcome an old abductor injury that was aggravated in the Germany v America match two weeks ago. He said that he would prefer the Premiership title to go to Liverpool if he had a choice as he still feels an affiliation with his former club. BBC Online scandalously name Steffen Freund as Tottenham's top flop. They call him invisible, which he has been since he is out injured !! Ledley King has been nominated as a candidate for Player's Young Player of the Year in the PFA Awards. The other players in the reckoning are Darius Vassell (Aston Villa), Steven Gerrard (Liverpool), John Terry (Chelsea and Kings Ferry Road Magistrate's Court), Craig Bellamy (Newcastle United) and Michael Ricketts (Bolton Wanderers). Chris Armstrong's agent has hinted that his client might leave White hart lane in the summer. He is available on a free Bosman as his current contract will expire even though he would like to stay at Spurs, but there have been no talks from Tottenham to retain his services. The agent - Phillip Graham - said on TeamTalk that Spurs are probably waiting to see if Armo regains full fitness before making a decision, although there would be a bevy of clubs chasing him if he was to leave. They would have to have long memories though as Chris has not played all season for Tottenham. Teddy Sheringham has donated an autographed tracksuit top from his 199 FA Cup appearance for Manchester United to Bury FC to be auctioned to raise funds for the cash-strapped club. Spurs have been linked with a 10 million Euro bid for 22 year old Ajax midfielder Andy van der Meyde. The former Dutch Under-21 international is also interesting Leeds United and Lazio. George Graham has taken the opportunity to stick the knife into Spurs fans by saying that they look no further than beating Arsenal each season rather than taking the wider view of progress. He said Arsenal do this and he is sure that Glenn Hoddle is looking to get a good squad together to make a push for European football. He also disn't lose the chance to put forward the young players he brought to the club (even though it had more to do with David Pleat) such as Anthony Gardner and Matthew Etherington, mentioning Ledley King too, commenting that they have done very well in the last few games. Shame Ledley has been out injured for the last one though. ... and finally ... Manchester City were promoted to the Premiership tonight without even playing. Millwall beat Wolverhampton Wanderers to leave City unable to be caught by the other Division One clubs chasing promotion. Stephen Carr will miss out on playing in the World Cup this summer as he has has a flare up of his knee injury. He told the club's official website that he will have to rest his inflamed joint for 6-8 weeks and is frustrated that he will miss the competition in Japan and Korea. He said that knowing he would not be able to play for Spurs this season, he hoped to play a couple of games and go to the World Cup finals. Now his priority is to get back playing football. Nice to see that his priorities are now sorted out. Glenn Hoddle said he felt for the Irish international at missing the tournament, but felt that he is young enough to feature in future World Cups with the Republic of Ireland. Sergei Rebrov has criticised the matches that Ukraine are playing as opponents for World Cup final qualifiers Japan and then against Romania in the same week with League games in between. He said that the flak aimed at the coach should have been aimed at the national FA, who made these fixtures. You would have thought he would have been grateful for some action after being left on the sidelines for so long at Tottenham. He also went on to slam those players who only try in qualifying matches and do not in friendlies. Dean Richards told the Spurs website that he was looking forward to facing the Arsenal strike force on Saturday, even though they are ripping through defences throughout the Premier League. He suggested that strikers appear to be getting faster and faster or that he was getting slower !! Spurs Youth coach Pat Holland said he was proud of the boys in the team after losing out to Everton in the FA Youth Cup semi-final. He said that he was pleased with the way the side played in the second half after he had told them to relax and show the watching Glenn Hoddle what they were capable of. Holland said in an interview on the Spurs website that if they had got the goal ten minutes earlier, there might have been more defending for the Toffees to handle. Empoli have revealed that they have received offers for their star midfielder Massimiliano Maccarone and they are believed to be from Roma, Chelsea and Spurs among others. Having featured in the last two matches, Matthew Etherington has pulled out of the England Under-20 squad for their friendly against Portugal. The Spurs management want him available for the Tottenham squad with matches against Arsenal and West Ham United coming up. Spurs will relay the pitch in the summer following the last game of the season, David Pleat had said in the match programme a couple of weeks ago that the six year old turf was showing signs of wear and Hoddle saw a good pitch as essential if Spurs are to play a passing game. Perhaps it is showing signs of wear and tear now as the ball has been on the ground for the first time in a few years !! Former Spurs Academy midfielder Ludwig Norbert has left his native France to try his luck at Glasgow Rangers. The 18 year old left Spurs when he wanted first team football and ended up at Lorient (not Leyton Orient), where Rangers have taken him from on trial until the end of the season. Monaco and Metz are also said to be watching the situation. Former Spurs reserve defender Mark Arber was expected to move from Barnet to Stockport County today, but the deal fell through after the two clubs could not agree a fee in the knowledge that Arber would not be able to play until next season. ... and finally ... Sven Goran Eriksson told Esquire magazine in an interview that any player over 30 who exhibited over-aggressive behaviour on the pitch would not be selected, as he would be too old to change. This was believed to be a direct reference to Graeme Le Saux, who recently has shown the nasty side of his character in matches against Spurs. Shame. Spurs Youth lost 1-2 at White Hart Lane tonight in the FA Youth Cup semi-final second leg to Everton to go out of the competition 2-4 on aggregate. Ben Bowditch scored Tottenham's goal. Click here for a report. Chris Armstrong said he was pleased to be back playing football after being out for nearly a year and that he enjoyed the 45 minutes of action he had for the reserves against Chelsea last night. He said he hopes to be in line for a first team place before the end of the season. ... and he might be needed. Les Ferdinand is out for the rest of the season after suffering a freak accident at home that resulted in him having a fractured wrist. However, the club deny knowing anything about the new injury, although Les says he will see a specialist soon to see the extent of the damage. Apparently, Spurs Executive Vice-Chairman David Buchler has been asked to help out with the ITV Digital situation seeing as how his expertise is in insolvency. He reckons the number of clubs that might got o the wall because of the collapse of the company has been overblown. Spurs are being linked with a move for the pair of Perugia's strikers in Serie A. 28 year old Greek forward Zivis Vryzas and his 25 year old partner Fabio Bazzani were both reportedly targets for Tottenham and now Middlesbrough have joined the chase for the twin strikers. ... and finally ... after next season's competition, Worthington will cease their sponsorship of the League Cup. Steffen Iversen is still to show his best form for Spurs and Glenn Hoddle told the official website that he is still full of talent that has not been realised. Hoddle said that he scores "ugly" goals as well as good ones. Chris Perry said on the Spurs website that the defence has been more solid since they have switched to a back four. He went on to say that they stuck to their guns yesterday and kept their shape to deny Leeds United in the hectic second half. Having retired through injury, Willem Korsten has taken up coaching at his old club NEC Nijmegen at their Academy. Spurs reserves were 0-2 down to Chelsea tonight at Stevenage Borough's ground, but fought back to draw 2-2 with goals from Danny Foster and Johnnie Jackson. The second leg of the FA Youth Cup semi-final takes place at White Hart Lane tomorrow, with the kick off at 7.00 p.m. Adults will be charged £3 for entry and kids £1. Go to cheer on the boys in action as they try and retrieve a 1-2 deficit from the first leg. Tottenham beat Leeds United 2-1 at White Hart Lane this afternoon, with goals from Steffen Iversen and Teddy Sheringham. For a match report, click here. For reaction, click here. Rumours circulating at the ground today reckon that Kappa will be the new kit suppliers for next season and the race for shirt sponsorship is between Budweiser and Sony. A story concerning tickets for next week's match at Arsenal came into the MEHSTG post box today. A Spurs fan applied for a £24.00 ticket for the game, but his application was returned as unsuccessful. However, the ticket office asked him if, for an extra 50p, he would want a restricted view ticket !! I suppose it means the extra money would go towards seeing less of the opposition ! !